Being that some of you are lucky enough to be on the layering front of things, I thought it was only fitting to bring one of my favorite accessories to the 5 WTW styling front. And since it's not quite time to layer up over here, I figured to incorporate warm weather alternatives to the mix. How do you do scarves? I love me some printed scarves :) Oh, how I wish I could pull off that headband look! Awesome advice! I'm always looking for new ways to wear a scarf. Great post. I love those prints scarfs!! Very beautiful scarf!!!! love it!!! so cute, love the one wrapped around your head. Lots of beautiful scarves - and great outfits! I love seeing you in purple and green, in the top outfit, gorgeous! These are such great ideas - I think you've inspired me to try the first one this weekend...I have a vintage scarf that would be perfect to use in this way - thanks! I absolutely love scarves. I look for excuses to wear them all year round (in the summer I'm all "But the restaurant could be cold!"). I've never tried them on my head though. I'm going to try it today. Usually I wear mine around the neck one way or another, depending on my mood and outfit, or use as a belt or bracelet or tie around bag handles, just like you did. In the past I also wore them under a blazer, as a top. I love all the ways you wear scarves, so cute! You are so pretty and fashionable! Love the first outfit, the colours you are wearing are amazing on you! Cute Megan! I love this post, especially since all of my scarves are out and ready to wear! Great Post. Scarfs have always been my bff and I've worn them all five ways listed here. number 3 is really nice! I love scarfs! thanks for the inspiration! Thanks for the comment on my blog. Want to follow each other? I need more scarves in my closet. You've styled them very well. Fabulous and chic! I love scarves, but I am so boring with them, I basically always wear them around my neck only. Love your ideas! Love the one with all the prints!!! 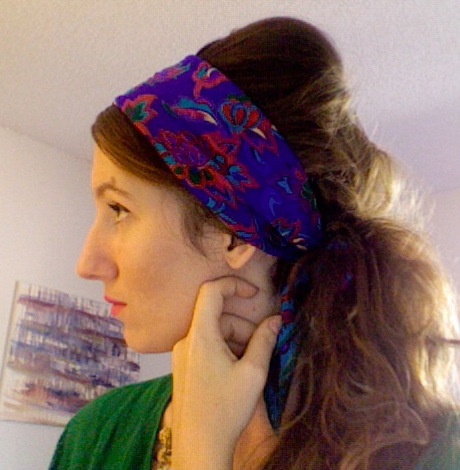 I definitely need to try incorporating my smaller scarves into hairdos-- I never know how to wear those! I love the look of scarves, but I can never figure out how to tie them on my head myself. Thanks for the inspiration! I can never get enough of scarves! great suggestions here.